(5) whistleblower allegations of patient death cover-up and a pay-off to presumably silence the whistleblower. We erred in not focusing more of our attention (i.e. just one paragraph) on an obvious competitive gap that exists for PODD in 2017-2018. We failed to drive home the fact that PODD's competitors are developing next generation products and at least two competitors, including the market leader, Medtronic (MDT) and Johnson & Johnson (JNJ) have new products that will enter the market in the next few months. For example, MDT has a recently approved product, the 670G (i.e. September '16). This is a next-generation product commonly referred to as an artificial pancreas ("AP"). As discussed in our initial report, PODD's President argued this device doesn't impact the Omnipod because it is not approved for children - which represent 30% of PODD's patient base. Analysts ignored the obvious fact that the other 70% of PODD's customer base can and may be tempted to try and could transition to these new AP devices. PODD is just now initiating a clinical trial of its competing AP device and does not expect it to enter the market until late 2018/2019. Therefore, MDT has a clear competitive advantage over the Omnipod until "late 2018" according to PODD's President herself - THERE IS A 2-YEAR PRODUCT GAP where Omnipod should struggle to compete in a fast-paced highly innovative market. 1. Our initial report outlined 5 key thesis points presented above. Not one of these topics was discussed at the investor day by analysts or management. When the management of a public company refuse to answer questions on a topic it is because they are human and they may not wish to engage in a discussion about inflammatory topic such as those we included in our initial report. However, they do not have a right to hide or not fully disclose material events or facts from their shareholders. We believe that is what is happening now and that it is only a matter of time before these 5 issues pose legitimate problems for PODD's management and by association, its shareholders. 2. Yesterday we emailed the 16 analysts covering PODD analysts our initial report and numerous questions they could have asked at the investor day event. None of these questions were asked. We are not surprised. Sell-side analysts are called "sell-side" for a reason and they are not compensated to obtain and report on topics that present a negative view of the companies they cover. However, ignoring information we present to them may cross a line. We'll see how they react. Thus far, we have only seen 2 of 16 analysts release notes or updates about PODD following yesterday's event. 3. We noted that the ongoing FDA investigation, another topic we did not necessarily emphasize in our initial report, was not addressed on the investor day call. This investigation has been ongoing for 20 months now. It poses a substantial risk to a 1-product company such as PODD. A prominent attorney who litigates cases involving FDA and medical device product defect and fraud actions and a medical device expert we consulted both confirmed that an ongoing FDA investigation lasting over 20 months is a sign of serious unresolved issues. Yet PODD management, the least transparent management team we have seen in some time, refuse to update shareholders on this topic. (i) PODD will not have a next-generation artificial pancreas device until late 2018/2019 according to its own President. (iii) The competition in the artificial pancreas space is diverse and substantial, in our initial report we noted 10 companies are working on AP products. "…our hesitancy regarding near-term (2017/2018) revenue growth is unchanged." "…we note current valuations - 5.1x 2017 street estimates - do not reflectan attractive entry point given limited near-term revenue catalysts and an increasingly competitive pump environment." "with the Horizon system not slated for US launch until late 2019, multiple players are expected to launch advanced pump platforms before Insulet. Specifically, Medtronic's 670g (2Q/17), Animas/J&J' advanced pump platform (4Q/17), Tandem Diabetes (4Q/17), and Bigfoot Biomedical (2019)." "Competitors are working to develop similar wireless technologies to achieve insulin delivery. If these products are able to reach market before Insulet is able to fully establish itself within the community, competitive headwinds would likely affect Insulet's ability to meet forward expectations." "If '17/'18 growth can be sustained while the pipeline is less robust…"
"Competitive product launches could keep OmniPod share flat instead of increasing"
"Near-term growth is likely the larger question for investors" Well there it is, a bit understated, but this is the truth! "The pipeline is more back-end loaded (2018/19 contributors)" Now that is some good spin, translation, watch out! "…the international ramp (~$225M RJe from ~$72M in 2016E) could prove a tad aggressive given their current footprint in key markets." Just a tad he says…everything will be ok, maybe? 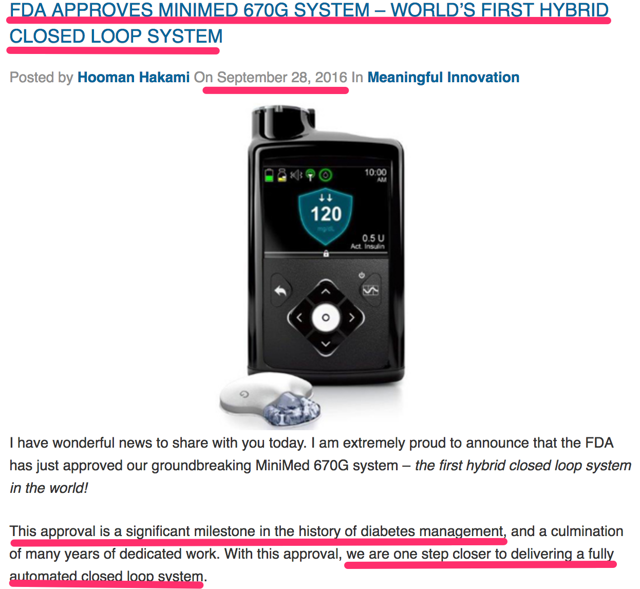 The market believed the competitive effect of MDT's 670G felt by Tandem Diabetes (TNDM) would also be felt by PODD. This is why PODD's stock dropped to $30.69 on November 3, 2016. These 3 analyst notes issued today re-emphasize and confirm the significant competitive pressure that MDT's newly approved AP device will have on PODD through at least 2018. We reiterate a $15 price target. This stock is a strong sell.